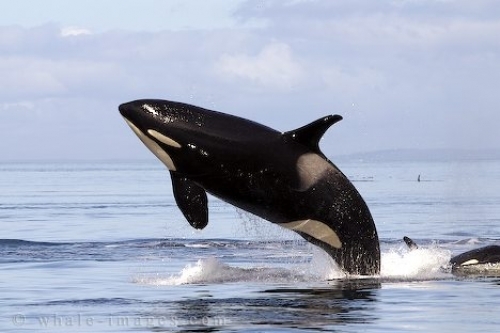 The power and strength displayed when an adult killer whale breaches is spectacular. I have captured many wildlife photos like this massive female killer whale who jumped clear of the water and landed on her side, creating a massive splash and thumping sound. This is yet another demonstration of natures power and majesty. It is thought that killer whales breach to either dislodge marine parasites or to display dominance to other orca whales. Wildlife Photos like this one are very difficult to get. Wildlife Photo of a breaching Orca Whale female in Queen Charlotte Sound off Vancouver Island in British Columbia, Canada.